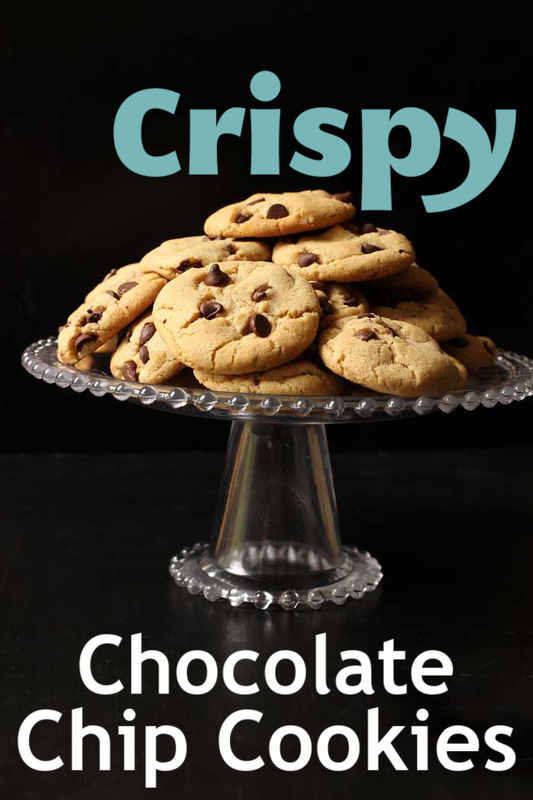 Do you love crispy chocolate chip cookies? Then you’ll love Gramma John’s recipe for chocolate chip cookies that are crispy and crunchy and tender inside. Learning to bake chocolate chip cookies is kind of a rite of passage in my book. And finding your pet, favorite, go-to, ultimo chocolate chip recipe is part of that milestone. For me, both these experiences are wrapped up in my Gramma John’s Crispy Chocolate Chip Cookies, a recipe that I’ve been baking since I was about 8 or 9 years old. My Gramma John was born and raised in Minnesota, living most of her life on farms. In her 85 years, she was widowed twice and raised eight kids — six of them boys. She died right after my second son was born. I think she’d get a hoot out of the fact that I have four boys. Besides being a brave and somewhat ornery woman — she was very determined to win at cards — she was a fantastic baker. I loved to bake with her! She taught me, but more importantly, she was just fun to be with. There are a few of her recipes that are also precious to me — her buttermilk donuts, her easy pie crust, and her crispy chocolate chip cookies. Legend tells that Gramma John, aka Esther Johnson, was sly in sharing her recipes; she would often alter an ingredient in the list before passing it on! My mom says she never knew if the recipes she received were the actual ones that won prizes at the fair. 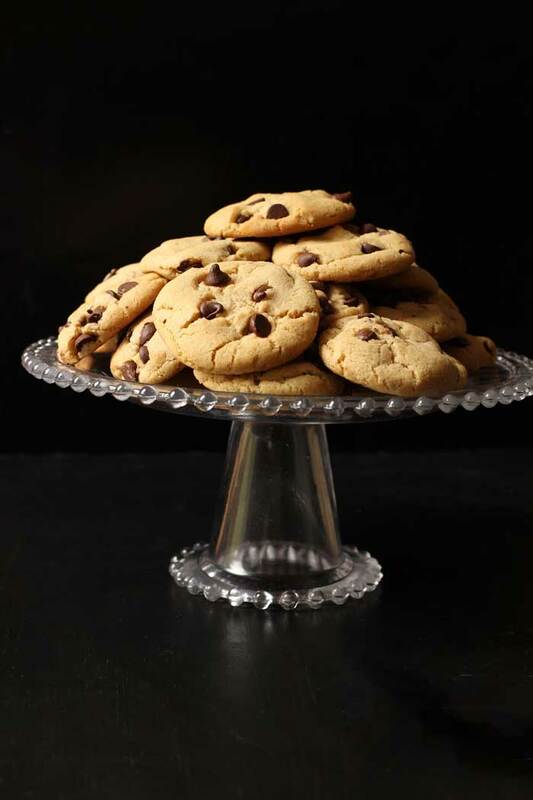 This recipe for Crispy Chocolate Chip Cookies is the one Gramma John gave my mom, her daughter-in-law. Hopefully, they were on good terms that particular day! 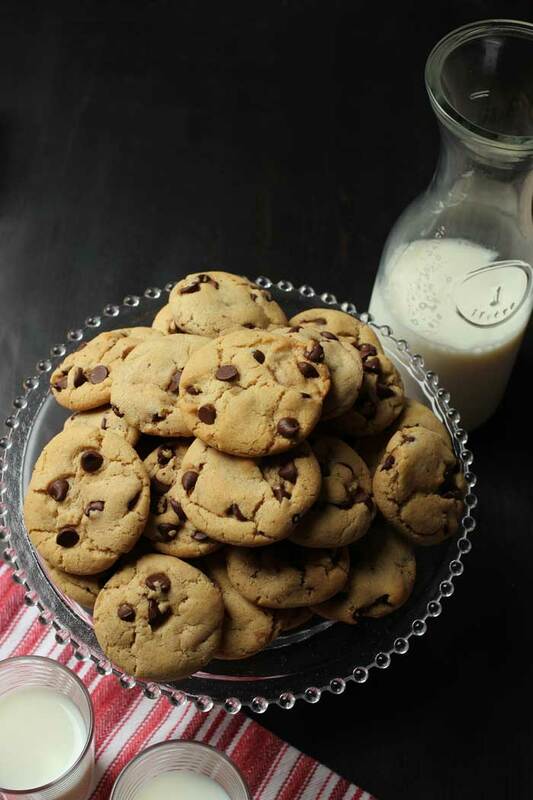 Now, some fifty years later, they are my pet, favorite, go-to, ultimo chocolate chip cookie recipe. They freeze wonderfully, baked or as unbaked dough. So, make all you want — and then make some more! What are the ingredients to make chocolate chip cookies? 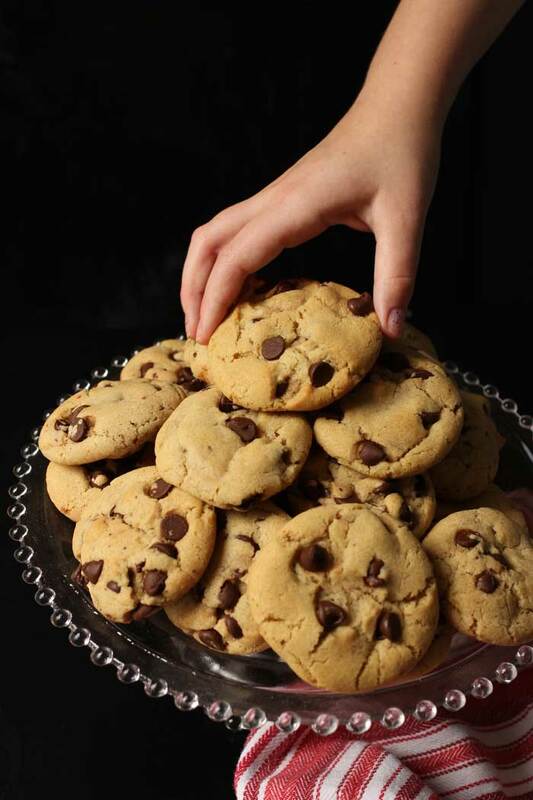 Chocolate chip cookies have a pretty simple ingredients list: a fat (like butter, shortening, or oil), sugar, flour, eggs, leavening, and chocolate chips. The texture of your finished cookie will depend on the ingredients you choose and what amounts you use them. For instance, using all white sugar will give you a flat cookie while all brown sugar will give you a plumper, chewy chocolate chip cookie. I never got a chance to discuss these differences with Gramma John, but my guess is that she did some playing with the recipe since she made this recipe to be part butter, part oil and part brown sugar part white sugar. I imagine there are so many different chocolate chip cookie recipes in the world because there are so many ways you can mix and match the ingredients. The science of cookie baking is fascinating! 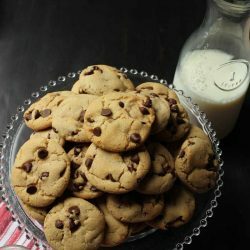 How do you make easy chocolate chip cookies? 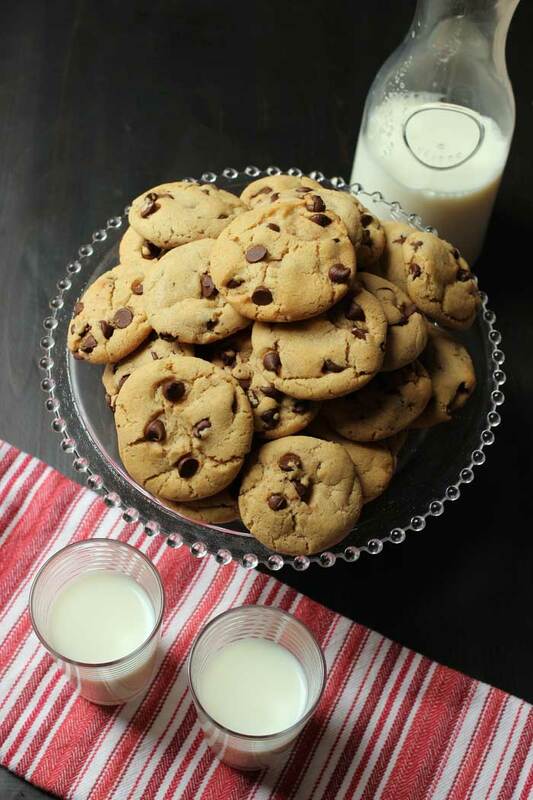 The easiest chocolate chip cookies are the ones that get the fastest from bowl to oven to mouth. My 12-year old daughter baked up two batches of these on a recent Saturday afternoon while watching reruns of Psych. Trust me when I say this recipe is pretty easy! But, more specifically, I love the ease of this recipe because the measurements are not complicated. No fiddling with 3/4 cups or 1/4 teaspoons of anything. Full measures make it quick and easy to get the ingredients in the bowl and onto the oven. Can I freeze chocolate chip cookies? Yes, you can and should freeze chocolate chip cookies. Especially if your kid makes a double batch. If you don’t you’ll be tempted to eat them all while watching reruns of Psych. There are actually several ways to freeze cookies. I use big plastic containers with lids to store baked cookies in the freezer. Make sure the cookies are completely cooled before layering them between sheets of parchment or waxed paper in the container. The cookies will be good in the freezer for several months — if you can keep from eating them. Buying in bulk – It’s rare that I would buy just one bag of flour. Instead I stock up when I see a sale. I also have gotten into the habit of buying cases of flour from Bob’s Red Mill. I practice the same bulk buying for spices and other baking ingredients. Repurpose holiday chocolates — If you’ve got chocolate leftover from a holiday (Easter? Halloween? Christmas? ), just chop it up and use it in place of the chocolate chips. You can often find these novelties candies for a steal after the holidays, so you may want to use them as a frugal alternative all year round! 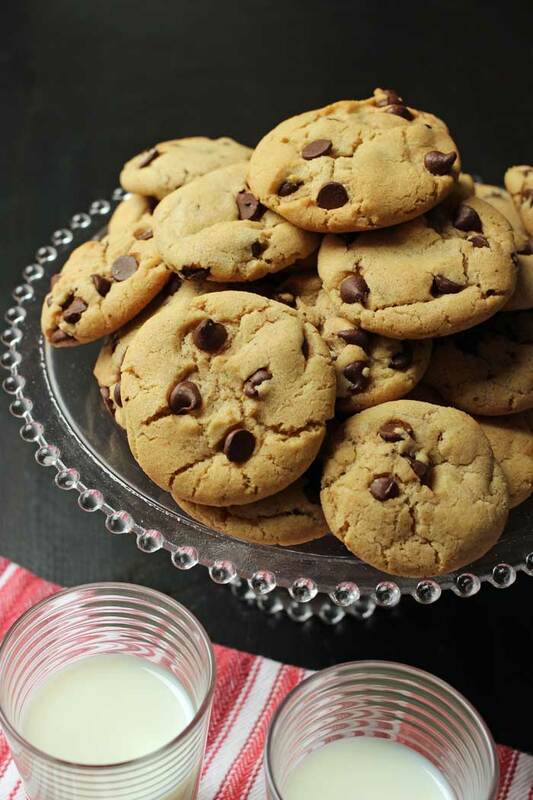 This Crispy Chocolate Chip Cookies recipe really couldn’t be easier than it is, but having the right kitchen tools can really make your time in the kitchen more enjoyable. Over time, I’ve honed my collection so that they are perfect for my needs. stand mixer – You can also use a stand mixer if you prefer. sheet pans – These heavy-duty rimmed baking sheets have been a game-changer! Do you love crispy chocolate chip cookies? Then you'll love Gramma John's recipe for chocolate chip cookies that are crispy and crunchy and tender inside. Preheat the oven to 350 F. Line cookies sheets with parchment paper or a silpat baking mat. Cream together the sugars, oil, and butter. Add the eggs and vanilla, mixing thoroughly. Blend in the flour, soda, cream of tartar and salt. Stir in the chocolate chips. Form the batter into walnut size balls and place them onto the prepared cookie sheet. Bake for 8-10 minutes or until set. Allow the cookies to cool for one minute on the tray before removing them to a cooling rack. Place baked and cooled cookies in layers separated by waxed paper in an airtight container; cover. Store at room temperature for 3 days or freeze for up to 3 months.